I start this post out with a large SIGH everyone. I am trying to figure my way through the new expectations of third grade and my son isn’t helping very much! When I wasn’t working full-time, I was far more aware of the expectations and procedures and this year…well, I’m not. As I was looking through my son’s folder, much like a detective searching for clues, I came across a school activity that interested me. 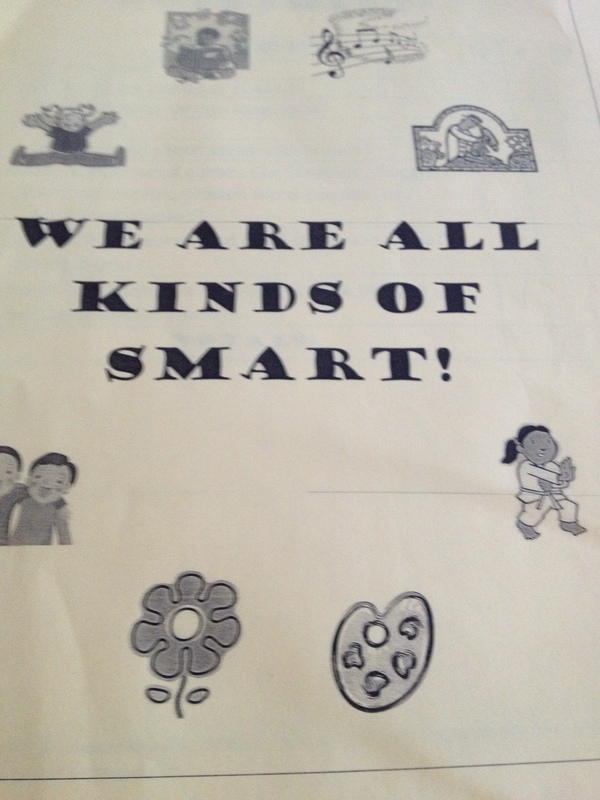 This activity was entitled, “We Are All Kinds of Smart!” I could tell by the front cover that the point of the lesson was for the students to reflect about their own strengths and weaknesses. As a parent of a child that has many strengths that are often overshadowed, I was happy to see that the teacher felt this was a valuable use of her time. Initially, I was shocked to see that my son had completed this entire packet. This time last year, the packet would have been halfway completed, crumpled and the rest might have had scribbled pages or decorated with thoughtfully executed Mine Craft sketches. I opened up the packet and I was bombarded by feelings. On each page, students gave themselves smiles for strengths, frowns for weaknesses or areas of little interest, and a question mark if they didn’t know. Since my boy is very black and white, I wasn’t surprised to see him avoid the middle ground of question marks. He is a “love it or hate it” type of kid and he has strong feelings on most subjects. As I read his self assessment, I was impressed with the clarity and honesty at which he marked his responses. Yes, he was harder on himself than he should have been and I was able to point out examples that showed he had additional strengths and interests that he didn’t consider at the time. When I turned to the “People Smart” page, I stopped. Do you make friends easily? Frown. Do you enjoy group activities? Frown. Do you feel confident when meeting new people? Frown. Each of the eight questions had frowns. In reality, he is stronger in this area than he thinks that he is and he has added to his “friendship skills” tool belt each year, but clearly he understands that it is harder for him than most. It is. I wished that it wasn’t, but it is. As a teacher, I see that the extroverts have it easier in school, but I have to believe that at some point, those clever, thoughtful introverts come out alright. As I was still worrying about the “People Smart” page, I turned to the “Self Smart” page. Out of eight questions, my son gave himself five smiles. This gave me a giant smile and a few tears. Do you stand up for your beliefs even if they’re not popular? Smile. This is where his skill of debating must be paying off! Do you know how you are feeling and why most of the time? Smile. Do you spend time thinking deeply about what matters to you? Smile. This page, the “Self Smart” page, was such a relief to see. I have to believe that this is a strength that will serve him well. School is a hard place for this kid of mine. He just doesn’t always see the value. After reading this packet, it shed some light on his feelings that he hadn’t always shared with me. A lovely read … and like Ashley, I was impressed with how well your little guy knows himself. Glad things are improving. We, too, are trying to find our feet in third grade. It is hard to figure it out! I. Love. This. I so very hope that my son will give himself similar smiles once he’s in third grade. That’s a bummer about him still not feeling like he is good at making new friends but I love his honesty. I feel smarter already. Thank you so much for sharing this. What an incredibly valuable exercise!! It sounds as though whoever’s in charge of the curriculum at his school has their head on straight. I’m glad it gave you a ‘springboard’ for jumping into conversation about the areas where you could see strengths and he struggled to. That’s a really awesome piece of schoolwork indeed. It seems like he really thought about his answers and answered honestly. I like how he knows himself so well!! Thank you. I actually thought he was hard on himself-saying he couldn’t build things (uh, Legos) and that he wasn’t good at math in his head. I love what Shiroi Tora wrote!! He is a treasure, Carrie! It’s a shame he gave himself a frown for each of those questions. The fact that he is not confident feeds into his anxiety. Maybe, the self-smart stuff can help him with his self-image and encourage the other area. 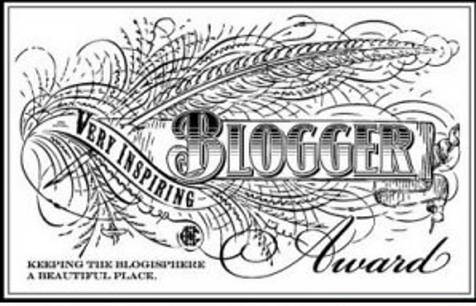 Thank you for visiting and adding your thoughts! He has the greatest of tools…those which most people lack…honest introspection. He knows that no problem may be solved without first identifying what the problem is. I was actually happy to see the frowns. It means he holds himself to high standards. When you couple this with his drive…it means he will eventually achieve those high standards. On thinking in “Black and White”…it is the hallmark of a true problem solver…a scientist…a deep thinker. People often think that the world is grey…that there are multiple paths up the same mountain. The problem solver knows that while there are multiple paths up the same mountain…that at any one time…taking into account all the variables…there is only one best path. One may be shorter…but may lack sufficient safety. One may be longer…but the slope is gradual enough for everyone to follow…etc. The color grey only matters in the world of the subjective. It operates in the world of the objective because people don’t look deeply enough, simply don’t consider all the variables to come to a rational conclusion, or simply don’t care enough put in the effort to search for the best way. It is far easier to label something as being grey and to not put in effort. Knowing that something is black and white demands time and effort to come up with the appropriate solution. While it is not always right to get the best solution (sometimes efficiency demands a lesser degree of accuracy)…to say all things are grey…is to never look in the first place. for a child to have put down all smileys, is for him to have been satisfied with where he is at. Someone who is happy with where he is at…has no reason to improve. No one should be happy with where he is at…only with where he is going. Because your son has higher standards, and he knows he still hasn’t reached those higher standards, he had indicated it with a frown. This automatically means that he knows there is a problem to solve…and because of his honest, and mature, introspection…there is true hope for positive change. So with the frowns…not only is his heart in the right place…so is his head. Your comments always challenge me to see things differently and this one is no different. I wouldn’t have thought of the scientist/problem solver with the black and white. I so appreciate your perspective. I love this. My son isn’t huge on the social stuff, although he’s not quite introverted. He’s an odd mix, actually of introversion and extroversion. We regularly hang out with a group of youth his age (junior high, mostly), and they’ve all known each other since K and 1st grade. They talk a lot about how they are all smart in different ways and how they can help each other because of that. That’s one area where schools are doing a good job these days, I think. I have a third grader who sounds a lot like this. I remember when she was in Kindergarten and I asked her if she wanted to sign up for softball. She said no. I told her that was fine, but just reminded her that all her friends would be playing and that she would likely be the only one not. She looked at me and said, “Mom, I don’t have to do what everyone else does.” I was immediately filled with both pride and sadness. I loved that she already knew it was okay to walk her own path, but I also knew how hard growing up can be for someone who does. Luckily, she has seemed to find somewhat of a good balance, though she has confided in me that she feels she is always struggling to fit in. It is hard to see your child upset, but I have to remind myself that I was a bit like this as a kid…and it ended up serving me well in the long run. Great post! As a mother and a teacher, I see how school and friends and recess can be and I know that won’t be the same experience for mine. It is getting better, much better and I’m so glad.